Back in the day, it was one heck of a drive. It was a narrow, gravel covered dirt road that wound through the Canadian wilderness like it had been laid out by a drunken snake. In the summer, the constant sound of gravel flying off of your tires and pelting the under carriage of your car, truck or camper could be maddening. Flat tires were common, as were broken headlights and windshields from gravel being tossed of the road by passing cars and trucks. Driving it and surviving it was a badge of honor. 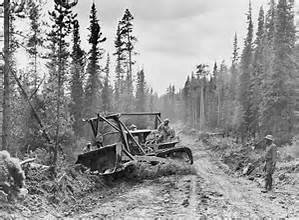 While it was only a barely two lane dirt road, it was called a highway, the Alaska Canadian highway, or "Alcan." As a young boy living in Anchorage, the first time I heard the name "Alcan" I wondered why anyone would want to put an "owl" in a can. 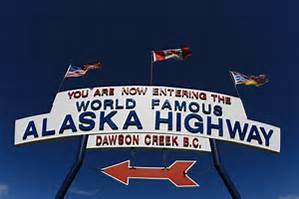 The highway begins in Canada at Dawson Creek and ends some 2012 miles later at Delta Junction, Alaska. Construction of the Alcan officially began in 1942. The first time our family drove the Alcan we went from Anchorage to Montana and then on to Texas. The drive from Anchorage to Delta Junction was uneventful, but back then, the Alcan wasn't paved like it is today. So once we entered Canada, we only drove 20 miles or so before we had our first flat tire. That evening we pulled into Beaver Creek, Canada and spotted this huge log hotel that also had a restaurant. We pulled in, had dinner and stayed the night. The next morning we got up early, ate breakfast and took off on our first full day on the gravel covered dirt road that would snake through the beautiful Canadian wilderness. I remember seeing cars, trucks and campers that had all kinds of things mounted on the front to prevent rocks from breaking their headlights. Most were contraptions made of wire mesh. Back then, the gravel would hit your vehicle under carriage hard enough that it could puncture your gas tank. Because of that, some people fastened different types of padding around their gas tanks. One thing I remember about the Alcan back in those days, was that road courtesy dictated that if you came upon a car, truck or camper stopped along the road, instead of just driving by, you would stop and ask if they needed help. Along the way, just as we were coming into Fort Nelson, our engine started sputtering and we barely made it to a service station. Once there, the mechanic informed us that we needed a part for our engine - but they would have to order it. We ended up staying at a local hotel for several days waiting for the part to arrive. On down the road, and in the middle of nowhere, a large truck came around a curve in the road. The truck was going pretty fast and it threw gravel up into our headlights, breaking one of them. We continued to drive as it got darker and darker until we came to a small settlement where we drove into a service station hoping they could fix our broken headlight. Fortunately, after some digging around, they found the one bulb they had that would fit our car. Later that night we pulled into a town and found a small hotel. We checked in and the desk clerk gave my mom the key. When we got to the room, mom handed me the key and said "Mike, my hands are full, you open the door." I put the key in the lock, turned it and opened the door. As I did, a lady sat up in bed, looked at me and screamed. I said "sorry", and quickly shut the door. We went back down stairs to see the desk clerk. When we told him what happened, he said "sorry, I'm new, I gave you the wrong room." With a new room number and key in hand, we went back upstairs. This time I made sure I wasn't the one who opened the door to our room. The rest of our Alcan trip was uneventful and when we ended up back on a paved highway it felt like we were floating on a cloud. On our return Alcan trip, headed back to Anchorage, we pulled into a cafe and hotel in Destruction Bay. While eating our lunch, some Canadian Mounties came in and told everyone that the road ahead was closed because of a bridge that had been washed out. We ended up having to spend nearly a week in the hotel while the Canadian Army repaired the bridge. I remember the day the Canadian Mounties came back to the hotel and informed us that the bridge had been re-opened and we could head on down the Alcan anytime we wanted. Back on the road and headed for Alaska, we were curious to see the bridge that had been washed out. Much to our surprise, when we came to the bridge it was nothing but a tiny structure over a very small creek. When our Alcan adventure was over and we were back in Anchorage, we were all happy to be off the road. While the Alcan is now paved and there are a lot more services available along the way, I remember when driving that narrow gravel-covered road took a lot of courage. Since that first trip, I've driven the Alcan in all seasons, winter, spring, summer and fall. It's a beautiful, but exhausting journey. Yes, I'm an Alaskan and I earned my Alcan badge of honor. I totally loved your description of the AlCan! It matches my memories exactly! I don't remember our first trip, as I was two years old when my parents loaded my brother and me into their panel truck (an old delivery truck, I believe) which was our camper for that trip, and headed out from Aberdeen, South Dakota, to Valdez, Alaska. I've heard many, many stories over the years, about that trip. 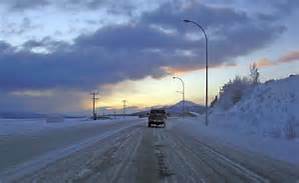 Then, in the summer of 1964, my dad, mom, and I piled into our Checker station wagon and began the long trek back down to Aberdeen, South Dakota to pick up my three siblings, who had stayed with our grandparents to finish out school (I had finished in Fairbanks, while staying with a friend and her family). I remember THAT trip very well. There was (as there always was, I believe) a lot of construction going on. We had the prerequisite flat tire in the middle of a foggy night, while going up Steamboat Mountain. Daddy was able to pull over into the parking lot of a lodge that was shut down for the night, unload the station wagon enough to get out the spare, put it on, and then we slowly made our way along, through the rest of the night. The two of them were trading off driving and sleeping, so we could make the trip more quickly. In the morning, we still hadn't gone very far, due to the terribly dense fog, but we found a really nice place to stop, get the better tired fixed, eat, and freshen up. Then we were on the road again. While in South Dakota, we experienced tornadoes and golf-ball-sized hail. On the way back, near Edmonton, we almost ran straight into ANOTHER tornado. We also had to wait out bears at a campground, so we could stop for lunch one day, and one night our tents (and--shudder--our sleeping bags) were covered in big, ugly, fuzzy caterpillars. Gross! We were all glad to get home, even if it was to little Valdez, torn asunder by the quake just a couple of months earlier. Later, when I was all grown up, married, with four children, and then divorced, my mom, my kids, and I took our two vehicles (I pulled a little Shasta trailer, and she pulled a nice-sized 5th-wheel trailer). Yup...it was just us ladies and four kids! We experienced a much better highway then (1978), but it still wasn't fully paved. In fact, the worst part was Steamboat Mountain! LOL. We did get to drive on some of the first paved areas that year, and I think it was only a few years later, that the seemingly impossible task of getting the whole highway paved was accomplished.